With the shock of Memorial Day Weekend behind us, Hollywood might just be hoping that we all just forget about the month of May and go back to the scientific definition of summer, as starting in late June. "Summer movie season? No, that hasn't started yet..."
Luckily, one of the safest bets in moviedom is on deck in the latest film from Pixar, Up. The third straight Pixar film to debut in summer as opposed to the fall, Up represents one of the studio's strangest sells to date. 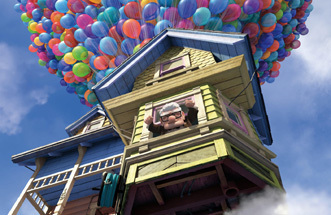 The film follows a grumpy septuagenarian named Carl as he lifts his house off its foundations with helium balloons and goes off in search of adventure. Hey, Pixar likes to think outside the box, okay? And, in fairness, this is a studio that's made hits out of a gourmet-cook rat and a trash-collecting robot. They go out on a limb, but the vast majority of the time, that limb proves to be much sturdier than people have expected. At this point, they've earned our trust. Strangeness of the overall concept aside, Up does actually have a fair bit going for it. The animation is spectacular as usual, with gorgeous settings, the adventure plot seems decently entertaining, and several supporting characters look like they're scene stealers, in particular, Dug the dog, and that big tropical bird thing. What's more, this is the first Pixar film to be offered in 3-D, and although I'm still not convinced of the idea that this is a lasting trend, 3-D sells a lot of one-and-a-half-times priced tickets right now, and "Pixar + 3-D" kind of screams "event" to me. Five out of the last six Pixar films have opened in the $60-70 million mark, but I expect Up to push past this barrier with this gimmick, winning the traditionally slow post-Memorial Day weekend with $72 million. Following behind it this weekend is Drag Me to Hell, which represents a return to the horror genre by one of its masters, Sam Raimi. After entering the film business with the Evil Dead series, a masterpiece of low budget horror filmmaking, Raimi has largely stayed away from the genre since then.